It looks like temperatures a few degrees cooler will be helping Exeter celebrate their annual Fun Days starting Friday and Saturday. Friday night plan to stay hot or keep cool. If you don’t mind the heat, head on down to the ball field for the slow pitch softball tournament that starts on Friday evening. If you are looking for a cooler location and entertainment to boot, downtown is where it is at. Head to John E’s in downtown Exeter for col drinks and karaoke from 9 to close. 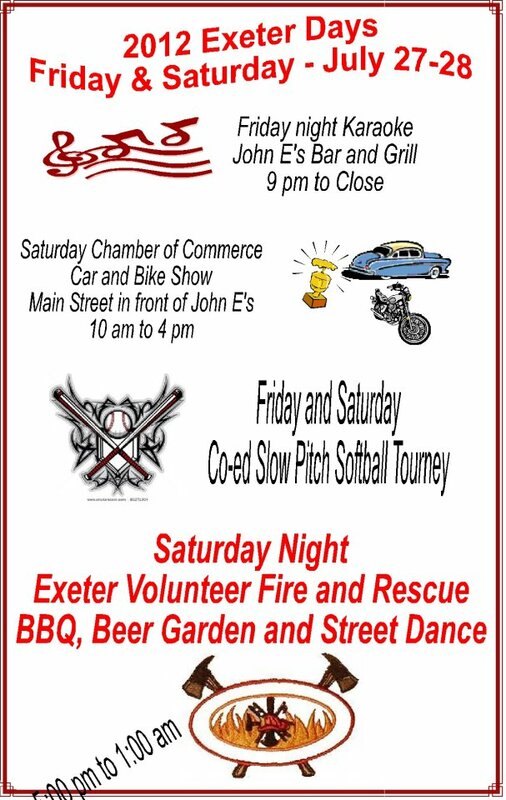 Saturday morning starts with a Car and Bike Show in downtown Exeter in front of John E’s from 10 a.m. – 4 p.m. Show up early, get your car registered for this free Exeter Chamber of Commerce sponsored event. There are trophies in several different categories and winners will also receive free entrance to the Street Dance. Fun and games for the kids with lots of prizes start downtown inside the street dance area from 10 – 11:30 a.m. Tickets (2 for $1.00) will be available for the games which include plinko, bug toss, ring toss and duck pond downtown inside the street dance area. This event is also sponsored by the Exeter Chamber of Commerce. The Village of Exeter will be sponsoring free swimming at the Exeter Aquatic Center all afternoon. If you are hungry for a snack head down to the ball field where from 9 a.m. – 1 p.m. on Saturday, Boy Scout Troop 270 will be serving concessions during the softball tournament. 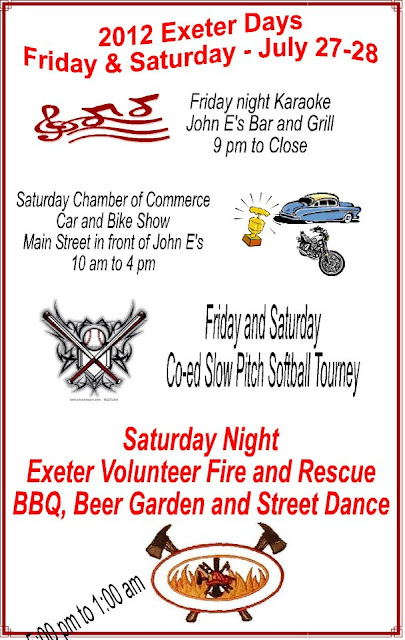 The evening entertainment and food starts at 5 p.m. at the Exeter Volunteer Fire Department BBQ and Street Dance featuring two live acts. Local favorites Rusty Nichol will open the evening playing live from 5 – 9 with Timmery and Joe taking over the stage at 9 and playing until 1.